Red kiwi fruit wins the Fruit Logistica Innovation Award. 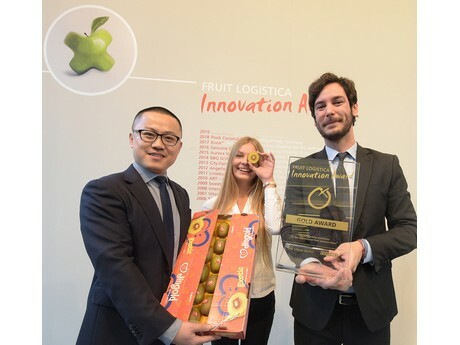 The “Oriental Red® – red kiwi fruit” from Jingold in Italy won Gold during the Fruit Logistica Innovation Award. Originally from China, the red Dong-Hong kiwi not only has unique organoleptic properties, but also boasts an excellent shelf life. As well as the fiery red colour of its flesh, trade visitors also commented on the fruit’s extremely pleasant, sweet taste. With a sugar content of 20 to 21 degrees Brix, the Oriental Red® – red kiwi fruit leaves an exotic aftertaste that enriches the international fruit trade.